Forex which stands for the foreign exchange market is the largest financial market in the world. With its volume of $5.3 trillion trades daily, can you imagine how large the market is? From the size of the trading volume, it’s obvious that there are a lot of traders and investors had involved themselves in the Forex market. You might be surprised that even in an economic crisis, Forex market can still remain profitable as currencies are always traded in pairs. 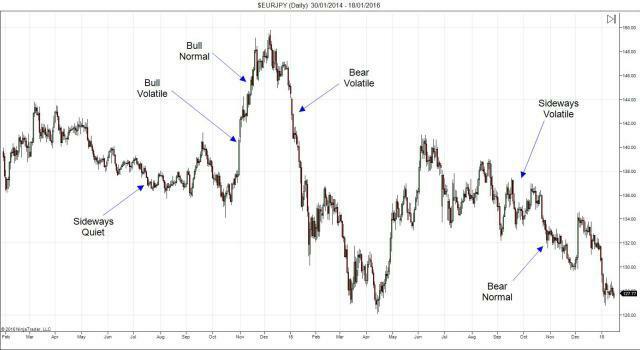 What are the primary types of Forex Market? Have you ever tried to read a price chart before? For those who did, you might notice that a chart is actually formed by Bollinger bands (a band plotted two standard deviations away from a simple moving average, which looks like lines) that are always moving up and down which forms different patterns. So, how should we identify the types of charts from observing the movement of the lines? Basically, when you saw the lines are showing an up trending movement, this is what we often called as a bullish market, which actually gives out the information that the economy is doing a great job. In the other hand, when you saw a down trending movement in a chart, this is what we called as a bearish market, which reflects the situation of a bad economy. Let’s have a look at this price chart above. We can see that the sideways quiet at the front part of the chart are mostly formed by flat and light Bollinger bands. As a contrast, a sideways volatile are also formed by mostly flat but wider Bollinger bands. When we compare a bull volatile and a bear volatile, we can see that they share the same pattern of near vertical shape and wide Bollinger bands. The only different between them is the upward movement of a bull action and the downward movement of a bear action. Same goes to the bull normal and the bear normal. Both of them have a wide Bollinger bands, the only difference is the upward leaning movement of the bull and the downward leaning movement of the bear. Forex 24-hours market can be broken up into 3 main trading sessions, which is the European session (London), American session (New York) and Asian session (Sydney & Tokyo). 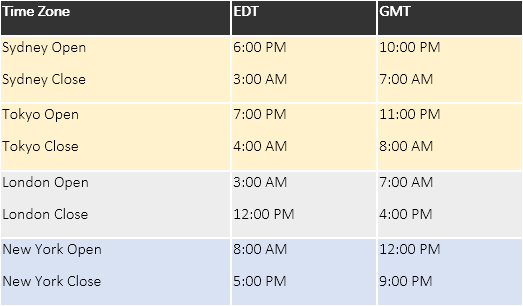 The trading week starts with the Asian session at 22:00 GMT, Sunday evening finishes at 22:00 GMT with the American Session Friday evening. The actual open and close times are based on local business hours which might vary during the months of October and April as some countries shift to/from daylight savings time (DST). The day within each month that a country may shift to/from DST also varies. You can see that there is a period of time where two different sessions are open at the same time. For example, during both summer and winter, from 8:00 am – 12:00 pm EST, the London session and the New York session overlap. Naturally, these are the busiest times during the trading day because there is more volume when two markets are open at the same time. It is actually quite simple to start your journey as a Forex trader. The only thing you’ll have to do is to look through the brokerage firms to find yourself a broker! Broker is the one who gives opportunity for small investors to initiate operations in the Forex market. To become a client of a broker, you’ll need to open an account and make a deposit. Of course, the amount of deposit might vary from broker to broker. In order to maximize their client’s profits, every company establishes certain credit level, which we called the leverage. With the use of leverage, you may invest in a small amount to gain a higher return. Forex can be traded 24 hours a day and 5 days a week. This is pretty suitable for those who wishes to trade on a part-time basis, because you can set your own time to trade. You can trade while having your breakfast, during your lunch break, or before you sleep! If you think that you might need a ton of money to get started as a currency trader, well that’s not true! Online Forex brokers does offer “mini” and “micro” trading accounts, with a minimum of account deposit of $25. This is a great offer for those who doesn’t have much trading capital to start-up with. Forex is the by far the most liquid market in the financial world. Without time limits and volume of trade, it is possible for you to make deals with the market at any time! As there always will be a buyer or a seller when you wish to sell or buy a currency pair. Leverage is a great tool provide by brokers which allows you to invest a small amount of money while trade it with a greater volume. By the use of leverage, it is possible for you to maximize your profit from 50 to 200 times faster in a single trade. But in the other hand, it also means that you might lose in 50 to 200 times quicker! You won’t have to worry about being charge with any types of fees, for examples clearing fees, government fees, exchanges fees etc. This is because most retail brokers are being compensated through something they called the “bid/ask spread”. You don’t have to be a professional to trade! Forex trading can be easy to learn as there are a lot of websites and gurus out there willing to share their skills. Opening a free demo account to practice and enhance skills before you start throwing your own money in a live trading can lower your risk of losing money.